The first known photograph of this species dates to 2002, taken by Richard Steventon, who unfortunately subsequently forgot about it. Georgina Jones and Sharon Albert re-discovered the species in 2005 and informed Guido Zsilavecz about it. Intrigued, he searched for them and had success, finding numerous specimens, with variable colouration, as shown. 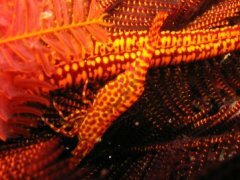 The species is always associated with the elegant feather star Tropiometra carinata, and be found both inside and outside of the crinoid. It occurs from relatively closely inshore in shallow waters to offshore in much deeper water. 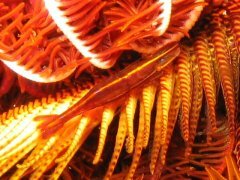 In 2006 Tessa Hempson conducted a survey of crinoids as part of her zoology honours degree from the University of Cape Town, to establish what animals live together with crinoids. SURG members were involved in these surveys. "Catagrapha is the feminine of the Latin adjective catagraphus, which means painted, coloured, figured. The name alludes to the complex and variable colour pattern of the species." New records of Atlantic Hippolyte, with the description of two new species, and a key to all Atlantic and Mediterranean species, Cedric d`Udekem d`Acoz, Zoosystema, 29(1), 2007. Symbionts of comatulid crinoids in False Bay. T. Hempson, 2006, University of Cape Town. Two Oceans, A guide to the marine life of Southern Africa, GM Branch, CL Griffiths, ML Branch and LE Beckley, 1994.